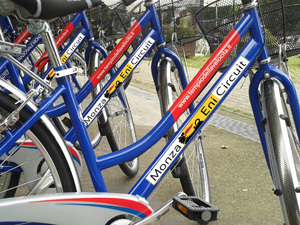 Autodromo and Monza Park, a huge green area. The best way to discover them both is by bicycle. At Infopoint it is possible to rent: city bikes to comfortably ride in the wide tree-lined avenues, or mountain bikes for those who also want to discover the hidden trails . The rental services include a bicycle workshop open to all cyclists and bike lovers that may have problems with their bicycles, as well as all information needed about the area.